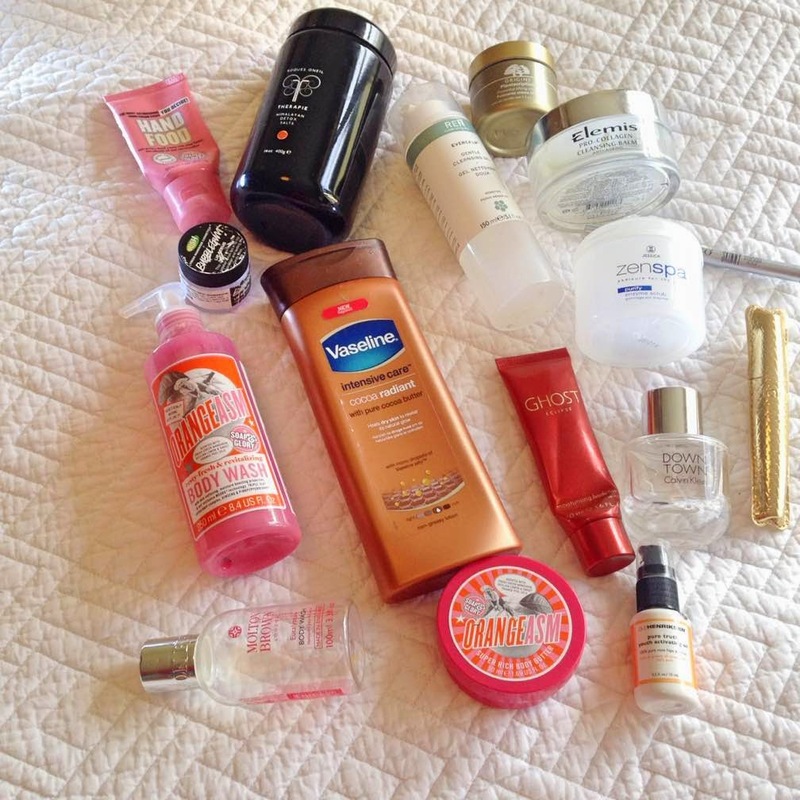 Empties & speedy reviews #8 featuring Tarte, Elemis, Therapie, Origins, Lush & more! I find it so satisfying when my Ursula Celano dressing table tidy is full of empties! I used to have far too many unloved & unused products on my shelves/in my drawers so it feels great to actually finish so many products. Last year I promised myself that I had to start using products up or pass them on because the situation was getting ridiculous! Today, I have a mixture of body & skincare products along with some make-up & a fragrance. I'll start with the body products as that is what I have most of. I very sadly finished another tub of Therapie Himalayan Detox Salts . I absolutely adore these salts for when I'm having a hard time sleeping. I don't use them every night, but if I am going through a bad patch sleeping-wise, I always rely on these. I've reviewed them here and I will definitely be repurchasing them. I also finished a Soap & Glory Orangeasm Body Wash & mini Body Butter, which I reviewed here and I will definitely repurchase these because I adore the scent. it is so uplifting & the body butter is very moisturising. Also from Soap & Glory, I finished a mini Hand Food which is a non-greasy hand cream that I love & have purchased many times & will continue to do so! Another empties post, another body lotion! I absolutely fly through body lotions & the one I have been using recently is Vaseline Intensive Care Cocoa Radiant, which I love because it sinks into my skin immediately, is non-greasy & very moisturising. I also love the scent & will definitely repurchase. Another body lotion that I finished is one that was in a gift set & it is in the scent Ghost Eclipse - I absolutely adore this scent & have already repurchased it! An item that I finished & won't be re-purchasing is from Jessica, which is a brand that I have tried & loved other products from, but this Zen Spa Purify Enzyme Scrub was a dud. It just wasn't gritty enough & didn't feel like it was exfoliating at all! Finally, for body products, I finished a small bottle of Molton Brown Eucalyptus Body Wash that was in a recent Lookfantastic Beauty Box. I really liked the scent of this, but I am unsure if I could justify spending £18 on it so may not repurchase. I finished another tub of Elemis Pro-Collagen Cleansing Balm, which is one of my favourite cleansers and I have already repurchased it. I also finished a tub of Origins Plantscription Powerful Lifting Cream, which I really love & have already repurchased. I reviewed it here. Also for skincare, I finished a small bottle of Ole Henriksen Pure Truth Youth Activating Oil, which I have a bit of a love/hate relationship with - I hate the scent but grew to love the product & what it did for my dry skin. Finally, I've included a bottle of Ren Evercalm Gentle Cleansing Gel, which I used after I had a bad reaction to Eve Lom cleansing balm, which I described here. This is a very soothing cleanser and is perfect for very sensitive skin. I finished a bottle of Calvin Klein Downtown, which I adored. It is a woody, musky scent & because it was an Eau De Parfum, it was long-lasting on the skin. I will probably repurchase at some point. Next up is probably the only item that I use from Lush - it is their Bubblegum Lip Scrub. I find it good, particularly in winter and always follow with lip balm. To be honest, my niece ate what was left in it, so it gets a thumbs up from a 2 year old too! Finally, I have two make-up empties: Eyeko Skinny Liquid Liner, which I did not like at all! I just seemed patchy and not black enough and Tarte Lights, Camera Flashes mascara, which I reviewed here. Whilst I liked this mascara, it is not my favourite so I won't repurchase it. My bag is now empty again, but it will be full again in a few weeks at the rate I am using products! What have you finished up recently? Please leave your links below if you have a similar post. I must give S&G Orangasm a smell soon, the range sounds super yummy! The scent is so invigorating! I love it! I have a huge box of empties sitting in my room at the moment and I have no willpower to start photographing them haha! Includes a billion mascaras! I have tried the Eyeko skinner liner in the past and hated it. I got a new one recently though and really like it! Weird haha!